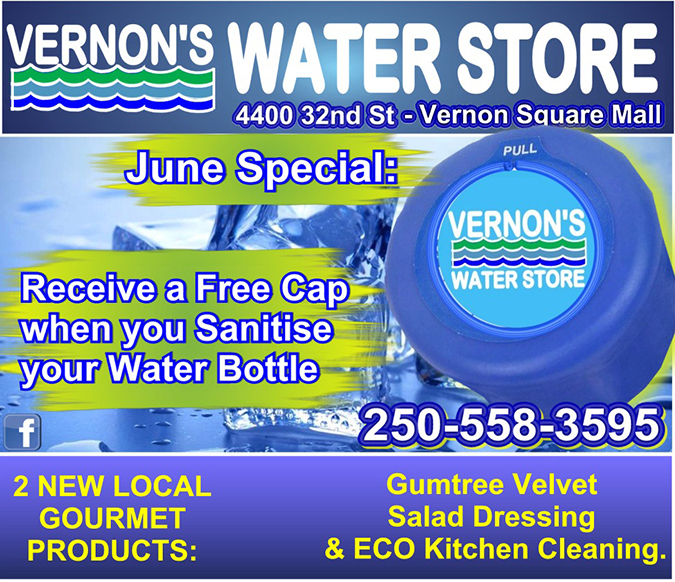 Vernon’s Water Store located in the Vernon Square Mall, sells and delivers clean, healthy water. We take pride in our service to the community through supporting local artisans and providing affordable water to our customers. Vernon’s Water Store is not just about selling and delivering water, water storage items and cleaning accessories, but we also offer natural products like farm fresh eggs, olive oil, Okanagan Preserves, Smokey Pete’s wild sockeye salmon, and art cards by local artists, providing a wide variety of items for our valued customers. Add one more service to our list! Give Ray a call if you need specialty sharpening. Ray sharpens carbide and steel saws, hand saws, router and drill bits, knives, scissors, chisels, planer and chipper knives. Got Questions? We Have Answers, Ask Us In The Form Below. © 2019 InfoTelMultimedia.ca - iNFOnews.ca - Vernon's Water Store - All Rights Reserved. View our InfoTel.ca listing under Water Coolers and Bottled Water for Vernon.